I just defended my habilitation, a rite de passage meant to evaluate an academic’s ability to develop a research program, to mentor graduate students and to hold a professorship. It’s a long process which begins with writing a thesis and ends up with answering two hours of questions from a peer jury. Part of the discussion looks like an unbounded meditation on the intellectual challenges ahead, with questions on methodology and future topics, yet the other is about navigating the financial and institutional constraints besetting the field, and they are especially critical in history of economics. The whole thing involves a deal of reflexivity and an insane amount of red tape. Below is the list of topics I wrote down when preparing the defense, those I wish to see historians of recent economics research in the years to come. It is more a wish list than an actual research program. Some of these topics are difficult to approach absent adequate archival data. And as a historian of science, I know all too well that research programs never developed as planned, and are largely shaped by data and coauthors found along the way. As it reflects my field of expertise, it’s all postwar, mostly mainstream and mostly American. What needs attention here is the making, reception and dissemination of these foundational texts. I am especially interested in learning how these works fit their authors’ largest programs, whether they owed their success to their conclusions or to their modeling styles, and how divergent subsequent uses of these models were from the author’s original intentions. Georges Akerlof’s Lemons paper (1970): in the past years, it has gained a special status. Its 25,000 citations makes it one of the most cited papers in the history of economics, yet its citation pattern requires further examination (WoS data). Its three rejections are often advanced to advocate perseverance, as well as to claim that thorough changes in science publishing are necessary to foster pathbreaking knowledge. A comparison with another outlier, Coase’s The Problem of Social Cost, might be worth considering. Yet Akerlof had not made his archives public yet. Robert Axelrod’s The Evolution of Cooperation (1984): game theory+ computers. Transformed biology, philosophy and economics among other sciences. Thomas Schelling’s spatial segregation paper (1971): influenced the development of Agent-Based Modeling and economists’ view of how game-theoretic models should be built and for what purpose. Interesting methodological investigation and interview have been conducted by Emrat Aydinonat, but more is needed. Most economists today work in applied fields, yet their history remains largely unknown, even after a 4-year research project designed to provide contexts and framing to their study. Environmental, labor, health, transportation, and international economics are covered to some extent; the history of development economics is the topic of the next HOPE conference. I have specific interest in urban, public, agricultural economics and finance. But we still lack the skills to provide full narrative arcs of how each of these fields developed and was transformed in the postwar. Duality and applied micro: our ability to write the history of applied fields is hindered by the lack of historical perspective of some of the tools applied microeconomists use. There are histories of demand curves, utility functions, Cobb-Douglas functions, but little on the adoption of duality techniques, a key element in the development of postwar applied micro. This requires diving into what was researched and taught at Berkeley in the 50s and 60s, and understanding Gorman. Same with microeconometrics. Mechanism design: econ best-seller for policy-makers (poster child for “economics-that-changes-the-world-and-saves-money-and-even-lives” including kidney market and FCC auctions) and IT firms alike. Consequently re-shaping the internal and public image of economics. Some past and forthcoming histories by Phil Mirowksi, Eddie Nik-Khah and Kye Lee, but nothing systematic. –Dynare: the debate on DGSE models is stalling, though a sociological layer has recently been added. While their origins have been extensively researched, their dissemination and various uses are less so. Studying the development and spread of Dynare would provide a “practitioners” rather than “big-men-with-big-ideas” perspective. –William S. Vickrey: understudied key protagonist of the development of postwar applied micro. Especially interesting given his broad interests: public economics, taxation, auctions, incentives, information, game theory, macro and more. 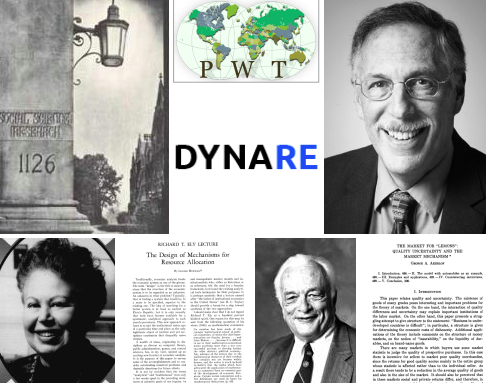 -Applied economists, in particular Irma Adelman, Zvi Griliches, Ted Schultz, Marc Nerlove and Nancy Ruggles. And no, this list is not “artificially” loaded with women. They were all over the place in empirical economics in the 40s to 70s. This might even be a reason why the applied tradition in economics has largely been forgotten. The ratio of women studying applied econ may have diminished as the prestige of the field grew in the 1980s and 1990s. A similar trend has been documented by historians of computer science. A way to study this trend is to look at the history of AEA’s CSWEP. – the inscrutable Kenneth Arrow. No justification needed here. What can be found in his archives is not enough not nail him down. The only option left, then, might be to construct a “shadow archive” by gathering the material found in the archives of his colleagues. But costly. –Minnesota in the 1980s: a single corridor where Prescott, Sargent and Sims researched alongside each other (the former is said to have hanged a sign “don’t regress, progress” on his door to tease the latter), interacted in seminars and on the dissertation committees of Lars Hansen, Larry Christiano and Martin Eichenbaum. Previous Is there really an empirical turn in economics? I’d gladly add (at least) one thing to your wish list: more women. Can I suggest the history of theory of the firm as an field that needs work. This means Coase and his “The Nature of the Firm” paper become important. Pas de projet en histoire de l’économie du développement? Je pense en particulier à Gunnar Myrdal, que William Easterly massacre dans son dernier bouquin. Vos conseils de lecture seront les bienvenus.